Eating healthy can be a chore. It is sometimes a difficult and stressful process. 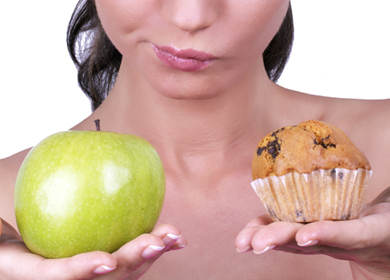 At first, changing your diet and reconstructing your lifestyle can be frustrating and can cause emotional discomfort. It is often described as a struggle. But just as all things that are worth it, the battle most definitely is rewarding. The phrase “practice makes perfect,” (although not necessarily accurate), is appropriate when considering healthy eating. When we spend a lifetime conditioning our bodies to digest unhealthy food, it is not easy to decide one day to eat nutritiously. Not only is it mentally exhausting, but imagine the shock that our body goes through. For example, say you have ten little soldiers who are assigned specific jobs within your body. One is responsible for fighting off infection, another is supposed to break food down into digestible sizes, and another is in charge of drawing nutrients and vitamins from food. But you have conditioned your body to consume convenient foods (fast food, meal-in-a-box, junk food and so on). Instead of fighting off infection like he’s supposed to, your little soldier is now supposed to help draw nutrients from food. And where one little soldier helped blood cell reproduction, he is now working overtime to help break down your food into digestible components. Where once you had a healthy functioning body you now have a body constantly trying to play “catch-up” and the “to-do” list is piling up. So, when you decide that you are going to cut the unhealthy, factory produced foods out of your diet it is no wonder that your body goes through such turmoil. However, by eating healthy daily it becomes less taxing and more refreshing. The “needs” (caffeine pick-me-ups, sugary and salty cravings) no longer bite at your ankles. Instead, your body functions as it should which will greatly decrease the likelihood of illness or disease. As with anything worthwhile, it takes time to readjust and acclimate to healthy food. It is like learning a new language, getting into an exercise routine, or attempting to study your Bible daily. All things take patience and understanding. You will not master French after one week of memorizing verbs nor will you be 100 percent free of hankerings for Hostess cupcakes after three days of conscious consuming. Before assumptions are made, one thing should be made perfectly clear. Healthy eating is not a death sentence. You are not dooming yourself to a lifetime of bland vegetables or salads sans dressing. Nutritious food can be delicious! In fact, nutritious food is often more flavorful and delectable because the natural essence is not smothered with additives or preservatives. There are many motivations for one to eat healthy. You can look at the long-term benefits of a life free from heart disease or diabetes. You can also see it as treating your body like a temple, because we should respect the gift of life that was given to us. Or, it can be seen as a means to fit into your favorite jeans again. Whatever the compelling reason is, there are more benefits reaped than losses calculated and in the long run your body will thank you.